This year at New Zealand Fashion Week I’ve been putting in some long hours, aided greatly by the inclusion of the likes of Osmosis Yellow Diamonds, Beyond Coconut Water and Moet in my daily diet! 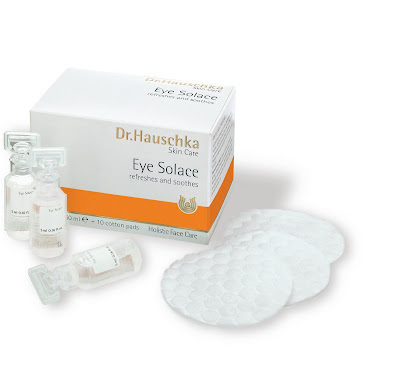 I’ve also come to rely heavily on a rather wonderful new discovery that has saved me from looking as tired as I otherwise would have, Dr. Hauschka’s Eye Solace ampoules. Eye Solace is a water based-product that harnesses the natural power of eyebright, fennel, chamomile and black tea, to cool and refresh stressed and strained eyes, leaving them blissfully revitalized and feeling almost new. The gentle formula helps give eyes a chance to relax and rest, and is especially suitable for those who wear glasses and contact lenses like me, or for sufferers of sore and itchy eyes caused by hay-fever (also me, awesome). The formula comes in practical single-dose ampoules that allow for a quick refreshing moment wherever you are, and have been the perfect way for me to wind down after a few long days this week. To use, just soak the cotton pad with the contents of one ampoule, split the pad and place over closed eyes. Put your feet up and relax. Magic! To locate your nearest stockist visit Dr.Hauschka’s website or call toll free 0508 423 737.